I had my first macaron about a month ago at Kate Spade's opening party here in KC, and it blew me away. 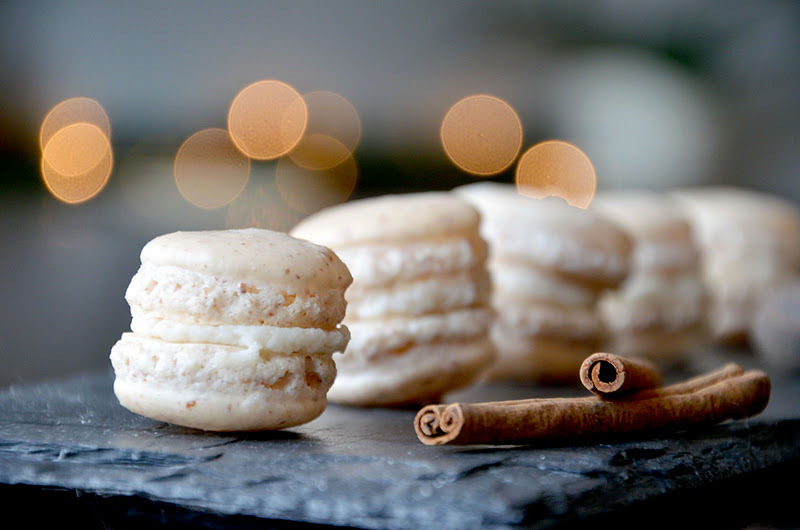 Macarons are not the dry, airy, meringue-looking cookie they appear to be. After that experience, I became obsessed with scribbling ideas for fun flavor combinations on any piece of paper I could find. Egg nog is hardly a new concept, but I have a few up my sleeve that I can't wait to show you now that I've gotten my feet wet and started to understand what makes these little guys tick. 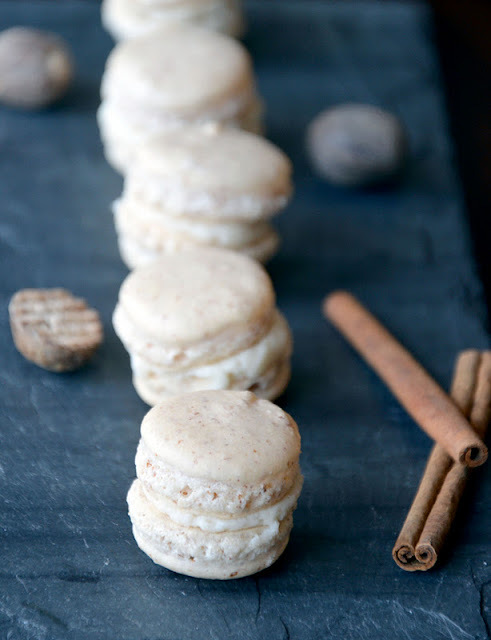 For some reason, I thought that the Great Food Blogger Cookie Swap would be a great excuse to make macarons. Because that makes sense. Especially when you set out to make them the day before they're due to be shipped. After reading everything I could on the internet about macarons, I set out to make 3 dozen with pal Carrie who came over for moral support and to try her hand at these delicacies as well. We learned a lot in the kitchen that day. And, thankfully, they grew feet and were edible! For the record, my family's Russian Teacakes were my backup plan. I did at least have a backup plan. 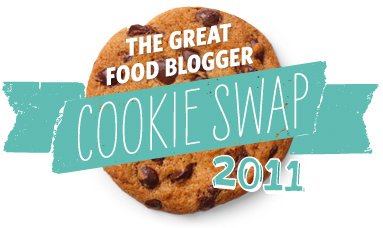 If you'd like to participate in future food blogger cookie swaps, you can sign up to receive more information when the time comes. Place the powdered sugar and almonds in a food processor and give them a good pulse until the nuts are finely ground. Sift through a fine mesh sieve to remove any large pieces of almond. Return large chunks to food processor and sift again if remnants are greater than 1 tablespoon. If less than 1 tablespoon of large pieces remain, discard them. Fill a pastry bag fitted with a plain round tip with the batter and pipe small rounds (1.5 inches in diameter) onto parchment paper or silicone mat lined baking sheets. Tap the cookie sheet firmly on the counter 3 or 4 times to alleviate air bubbles. Let the macarons sit out for 30 minutes to an hour to harden their shells a bit. In the meantime, preheat the oven to 280F. When the macarons are dull and appear to have formed a skin, bake for 15 to 20 minutes, depending on their size. To test for doneness: choose a macaron to sacrifice and carefully attempt to pull up the edges. If the macaron pulls away from the parchment easily, it is done. If it sticks, return to the oven for a minute or two. Let cool. If you have trouble removing the shells, pour a couple of drops of water under the parchment paper while the sheet is still a bit warm and the macarons will lift up more easily do to the moisture. Don't let them sit too long or they will become soggy. Once baked and if you are not using them right away, store them in an airtight container out of the fridge for a couple of days or in the freezer. Remove bowl from the stand mixer and fold in egg nog, cinnamon and nutmeg. Adjust spices accordingly. If it doesn't seem quite like egg nog, odds are you need to add more nutmeg. Pair shells of similar size and pipe buttercream onto one, then carefully press together to complete the macaron. Macarons are best 24 hours after they are finished. I couldn't wait that long, but I did notice a difference after 24 hours had passed - they really did get better with age. Store in an airtight container at room temperature. beautiful photos! I've only made macarons once, but I was so happy when I got my "feet"
these are gorgeous! If I wasn't traveling I would have been all over doing the swap. Everyone has had so much fun it looks like with it! And your hair in your sidebar pic = GORGEOUS! they. look. so. perfect. I. might. freak. a. little. 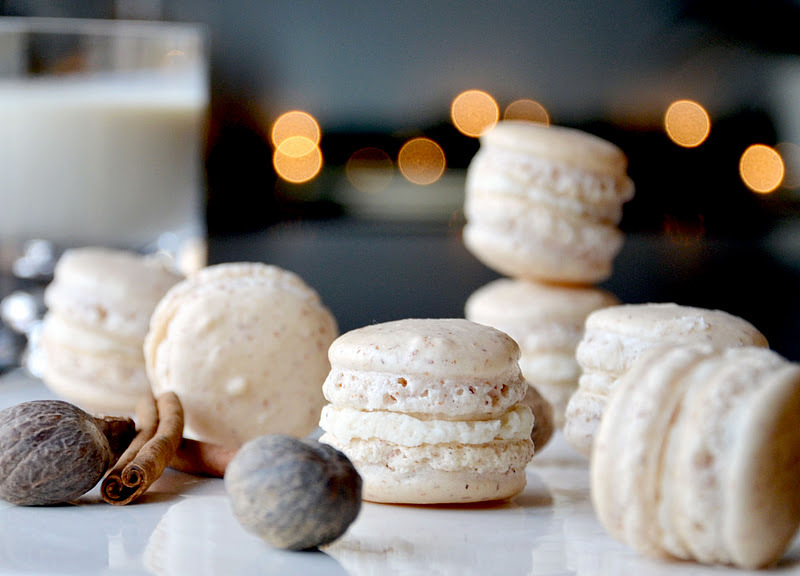 I admit that I've never been a fan of eggnog but these are so beautiful, I'd have to give them a try. Absolutely stunning! My husband ADORED these cookies. I only got to eat two, hahaha! I hope it is OK if I take one of your pictures and put it on my blog to link people to your page... I want them to see the yummy cookies I received, and I forgot to take pictures of them! Sure, Tiffany! Glad you guys loved them. could these be any cuter?! i'm in love! What a genius idea! I haven't entered the festive mode until I saw these! I've been waiting to see who would make a macaron for the cookie swap!!! SO glad you did, and, seriously awesome flavor! I was in this cookie swap as well. Fun! Your cookies look so festive and delicious! I LOVE These! And your pictures are amazing! nice, my kids will surely love this. hihi. Hey there! I'm new to the KC area, and I'm your newest follower! :) I had coffee with Cassie, at Bake Your Day, yesterday and she told me about your blog. Looking forward to meeting you sometime and I love your blog! Very nice! A great idea for a flavor. Just made these- wow by far the best recipe for new makers of macaroons- thanks so much! Nice treat for the Christmas season.